A quiet end to the week for silver spot prices which, having broken above all three moving averages earlier in the first half of the week, then found it hard going to move higher in the second half, with Friday;s candle once again trying to edge higher, only to fail to make any progress into the potential resistance immediately ahead, which is now proving to be a significant obstacle. Technically, the gold and silver charts remain very different with spot gold prices breaking out into new high ground on a daily basis, and forming a well defined long term bullish trend, whilst spot silver prices struggle to break through this sustained level of congestion in the $16.00 per $18 per ounce level. For longer term trend trading in silver we need to see a breach of the $18.50 per ounce price level which should then pave the way for an attack on the minor top of $19 per ounce last seen in July 2008 with $21 per ounce the next target thereafter. 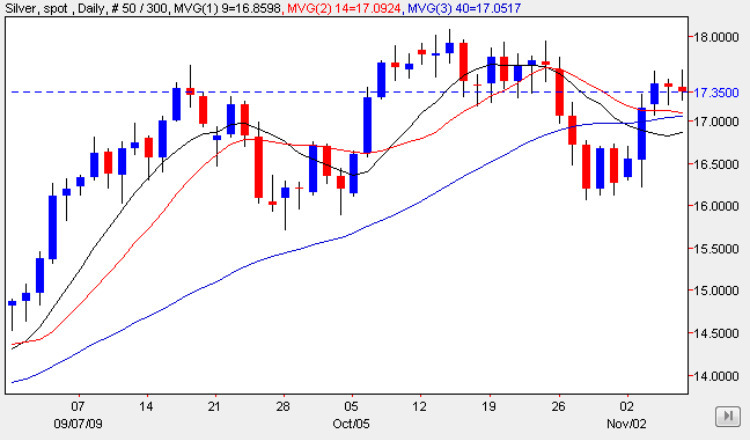 It is interesting to note on the weekly chart for spot silver, that the price action for the last two weeks has found good support from the 14 week moving average, suggesting that the bullish tone remains in place for the time being, and with a strong technical picture on the daily gold chart, this should provide the necessary momentum for silver as a result.